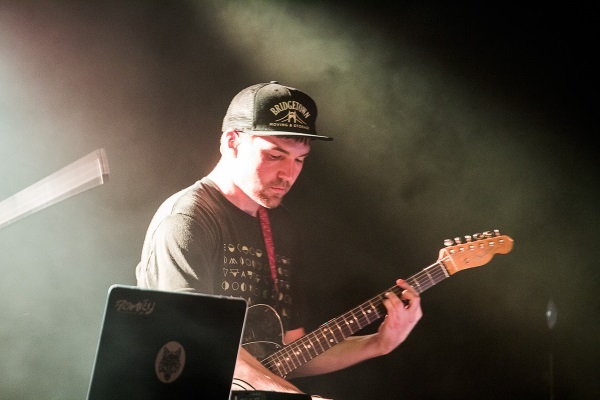 Emancipator and his Ensemble played a masterful show at the Roseland on 11/13. It began like any Friday eve in November on the busy corner of Burnside & 6th. A crowd of amped fans gathered the outside the Roseland Theater anxious to duck out of the rain for a night of beats and melody. Yet on this particular night, the crowd was split: half were there for the Eric Bellinger show on the ground floor (Peter's Room), half for Emancipator (main stage). Double shows meant double the crowd. It was a less than warm reception from the venue, with more than a few fans muttering in frustration at a chaotic entry system not unlike an airport terminal on December 24th. For their part, the venue staff certainly earned their pay funneling the patient mob through this gauntlet of frisking and will-call lines into a crowding entry area with improvised smoking areas with no rain cover. But enough about that. How was the show? Surviving the gauntlet came with great reward, starting with opening act Manatee Commune, aka Grant Eadie of Bellingham, WA. Armed with chill beats, a violin, and trippy visuals, Manatee soothed rattled nerves and cleansed the figurative palate. He danced from instrument to instrument with ease. One moment he was looping a riff on the laptop, the next he would dive into a moving violin solo. Manatee juggles his sonic myriad so adeptly that one would think him a shoe-in for Emancipator's ensemble should an opening ever arise. Jumping on the decks next was Blockhead, who changed the vibe entirely with a bevy of hip and trip hoppin' dubs. His was a harder, funkier flavor that gave the dancefloor a house party vibe while scenes from Rocky, Indiana Jones, and B movies melted into one another onscreen. The pit had swelled with expectant fans when Emancipator finally took the reigns. Though not quite a sold out show,every corner of the venue felt crowded - even the 21+ upstairs balcony saw fans filling the seats, standing in the aisles, and forming a rowdy mob around Roseland's only bartender. 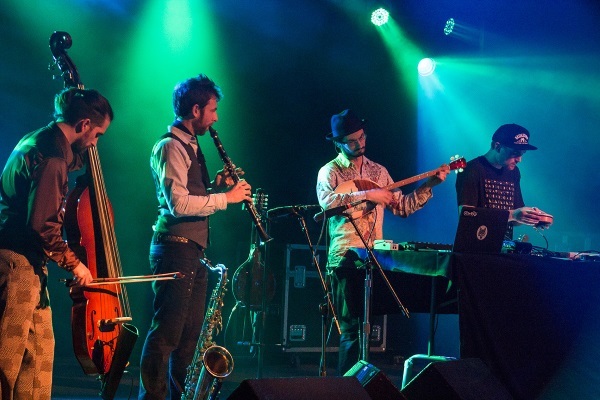 Emancipator (Douglas Appling) led his Ensemble to take their places onstage as a formidable six-piece featuring bass, keys, drums, clarinet, Ilya Goldberg on violin, and Appling at the center of it all. How does one describe the live Emancipator experience? 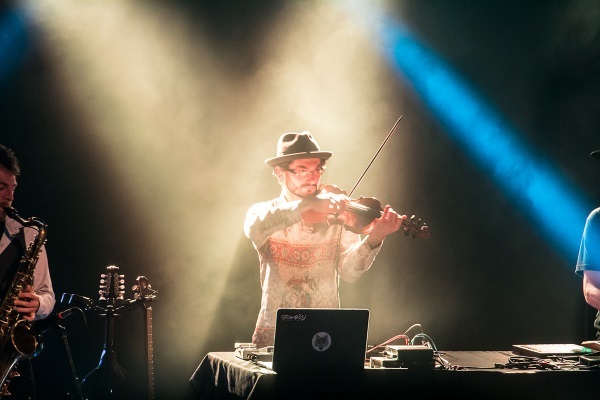 Maybe you've heard Emancipator's new Seven Seas album, or his older stuff, but you haven't seen him live. You might think you'd know what to expect, but in fact you'd only have an inkling. Seven Seas' titular track features Madelyn Grant's soulful stylings. "1993" is memorable for its interplay of rapturous violin and poignant guitar riffs. There are jazzier tracks, like "All in Here" or "Honey," which is as smooth as the name suggests. But whereas an Emancipator song is a many-layered melody eliciting calm, inspiration, introspection, an Emancipator show is a musical voyage that's hypnotizes, enraptures, and often surprises. At the Roseland, Emancipator's live twist on "Seven Seas" muted Madelyn Grant's vocals somewhat, whilst emphasizing instead a slower, harder rendition that was heavier on the drums. Ilya's violin came to the fore, during "Dusk to Dawn" visibly moving the crowd. Dancers smiled and nodded to each other in approval, lovers kissed and gazed at each other in bliss, and the vibe in the room hummed with positive energy. About halfway through the show, a haunting and familiar melody that got a rousing response from longtime fans: "Valhalla," a crowd favorite. It was around then time that Appling and the Ensemble had really warmed up. At one now with their instruments, the musicians grew more and more intent on their melodies, at times playing to the point of near frenzy without once falling out of harmony. They played an astounding version of "Anthem" so fast, so impassioned, that their drummer's playing approached drum'n'bass speeds. And when finally Emancipator and Ensemble returned to do a final encore of "Ares," it was such a soaring, dramatic performance as to feel like the final scene from a great Greek tragedy translated into sonic notes. In short seeing Emancipator live isn't just about watching six guys play uptempo renditions of your favorite songs. It's about getting swept up in the rapture of Ilya serenading you with his violin. It's about feeling the passion as Appling takes up the guitar to bring his songs to life. It's about riding that wave of sound as they bring their instruments to climax. It's knowing these six artists came together to create music not just for you, but with you. And that's something you just can't get in the comfort of your living room, even with the best speakers money can buy. 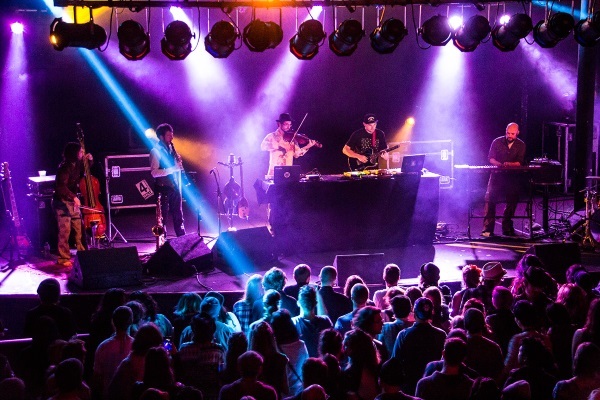 One more thing: Emancipator's Seven Seas Tour is far from over. 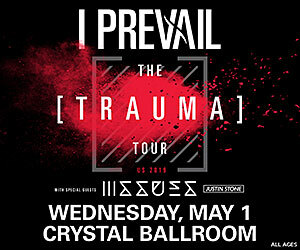 If you're willing to travel a bit south this later this year, you can check out the show for yourself at The Armory in Ashland or Hi-Fi Music Hall in Eugene.